You’re looking for a reasonably fun time-waster and can put up with annoyances like mandatory ads and limits on how much you can play. Mobile gaming intrigues and infuriates me in equal measure. On one hand, the low barrier to entry means that niche franchises and small teams with fresh ideas can genuinely flourish. On the other hand, this also allows greedier companies to flood the market with cheap, throwaway games that milk money out of unsuspecting players. Sega’s Hardlight studio has jumped between the two for some time, but none of their titles bridge the two approaches quite as efficiently as Crazy Taxi: City Rush. 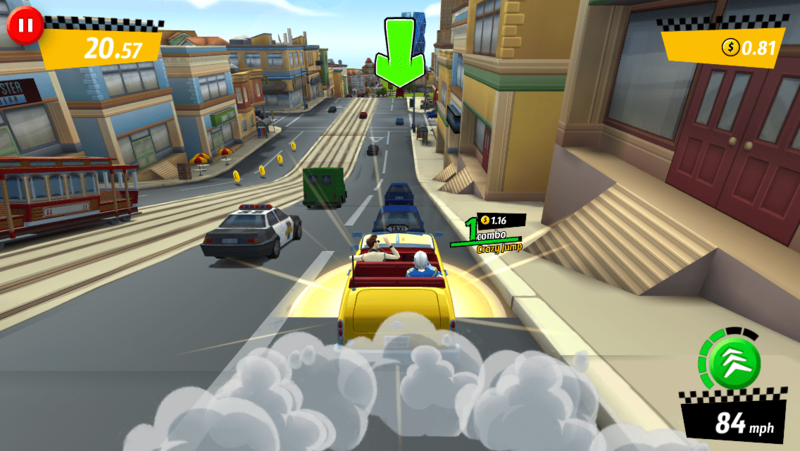 Crazy Taxi: City Rush’s cartoonish look complements the gameplay well. At first glance, Crazy Taxi: City Rush might stand in contrast to what you expect from the series. In lieu of a play-until-you-run-out-of-time mode, you must instead choose from several different missions strewn throughout the game map. After selecting one, you’ll drive your taxi through the packed city streets, avoiding or ramming into traffic while racing to deliver your passengers. Your taxi will always lock to one of the lanes, and you can swipe left or right to change lanes as you boost through cars and collect extra cash and time. It’s still a Crazy Taxi experience at its core, but one that’s been modified and optimized for the mobile space. Despite some framerate issues on older devices, the gameplay actually works quite well, and I had a lot of fun with it. There’s a surprising amount of customization available as well. 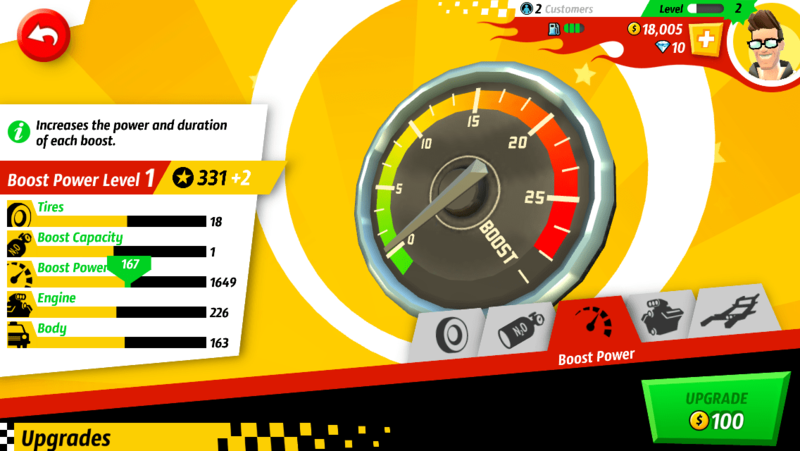 You can purchase multiple taxis, and each one has its own set of upgrades that offer lots of useful improvements: additional boosts, a faster top speed, the list goes on. Since you earn a decent amount of money from most missions, you can obtain many of these upgrades fairly easily, even if you only play casually. This adds a reasonable amount of depth to the game, and it’s nice to see an upgrade system in a free-to-play title that actually means something. The game’s upgrade system is surprisingly deep. However, in a thoroughly unsurprising twist, the whole free-to-play thing hovers over the experience like a storm cloud that rains on you when you don’t want it to. The in-game “gas meter” depletes with each mission you play, and if it runs out, you can’t play anymore; you’ll need to watch ads, pay money, or just wait for the meter to refill. It drains completely after just four missions, whether you beat them or not, so unless you fork over some cash, you’ll never be able to play for very long. Unfortunately, the annoyances don’t stop there. Full-screen video ads after most missions will continue to test your patience when all you want to do is keep playing. The fantastic tank destruction missions require you to spend in-game resources or actual money if you want to play them more than once every day and a half. Offers for other microtransactions crop up less frequently than in other mobile games, but just often enough to be a nuisance. In some ways, Crazy Taxi: City Rush is the most frustrating kind of mobile game: one that’s genuinely fun and addictive, yet plagued by restrictions that prevent you from enjoying it too much. If a paid version existed that let me pay upfront and play on my own terms, I’d be all over it, and the final score would be higher as a result. As it stands, however, we’re left with an oddly enjoyable mobile title that can get on your nerves while never quite capturing the insanity of the originals. If you’re willing to look past the nagging free-to-play elements, this taxi is just crazy enough to be worth a ride. If not, there’s always that $5 port of the original game.